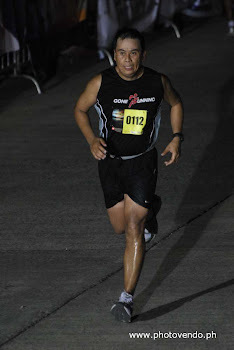 It all started when Jay asked me early this year, “Bro, Camsur tayo?” (the Ironman 70.3 Philippines event). During that time I had no basic skills for swimming and Jay with no base in cycling. I took it as a joke at that time not knowing that he was in fact serious when he raised that question. I told him then that I plan to do a half Ironman in 2011, and a full Ironman in 2012. I thought that doing it this year would be too soon. 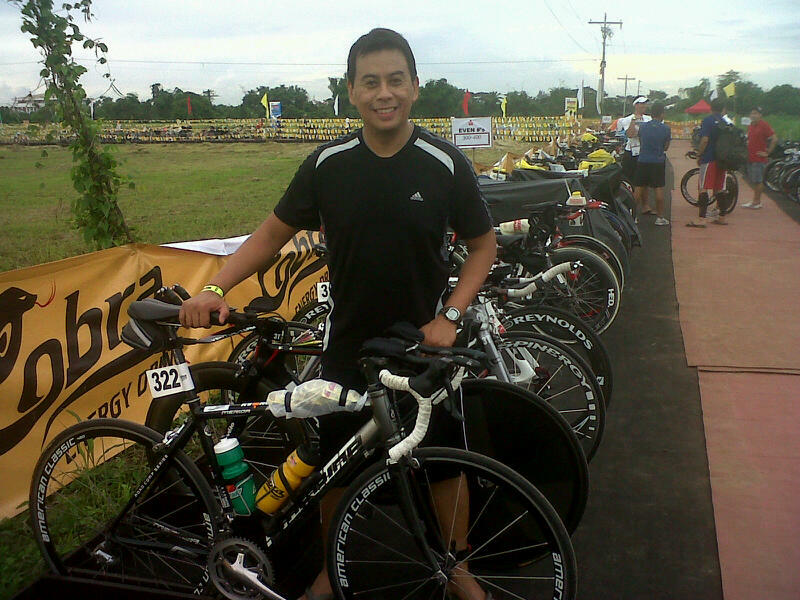 In March, we talked about it again and was starting to look at the Ironman 70.3 Philippines website. One day, he was playing around with the registration and probably was trying to navigate the registration process only to find out that he had registered and was given a confirmation code. He called me and said that he registered and we laughed about it and we both ended up registering for the Half Ironman event, with only 5 months to train. Crazy huh?, I had no swimming skills, and Jay has no bike at that time. It’s the first thing that any athlete would do, register for a race and prepare for it. Now we are locked to it and have no choice but to start training for it. Immediately, I talked to my friend (Dante Pahud) in UPLB who is a member of the UPLB Trantados Tri Team. He was a good swimmer and asked him if he can coach us for the swim. At first we are only looking for a swim coach. He endorsed me to his cousin who he said can train better. I contacted Ian Castilla (3-time ironman finisher), who just came back from the Ironman event in Langkawi Malaysia and asked him if he can coach us. Luckily, he offered a full training for the 3 disciplines (swim, bike, and run). We agreed on the schedule and off we went to start our training. I’ll blog about the training experience separately. Obviously bulk of my training was focused on swimming and honestly I was not sure whether I can even start the race since I was having difficulty improving my swimming skills, breathing in particular. Also, I got sick for 2 weeks in May and was busy in my wedding preparation in June where I lost about a month of training (adding to the pressure). I have told Jay and coach Ian that I might not be able to make it, but they didn’t give up and said that I can make it. So there I go, followed every instruction and religiously followed the training program. We had 2 tri simulations in UPLB, and that helped me boost my confidence. A week before the camsur event, we went for an open water swim in Laiya Beach in Batangas. That helped me overcome my fear in water and told myself I can do this. When I was able to do a straight 2km swim in my training (3 weeks before the race), I knew I will make it as my confidence have shoot up. I remember the time when I was training for my first marathon where I was not able to follow the training plan due to series of injury from running. I used that experience as a motivation that if I was able to do my first marathon given the odds, then I can finish my first triathlon. We rode to Camsur in Aug 20 with my wife, Jay, Noemi (Jay’s wife), and my cousin Nick who was driving. I was actually excited and convinced that I will start and finish this race. As soon as we arrive in the afternoon we checked in and headed to CWC to meet the rest of the guys. We did a 1k swim on the lagoon to get used with the environment, I was a bit nervous but after a while I was convinced that I am ready to enjoy the race. Then, we proceeded to the carbo loading party, saw coach Rio dela Cruz and his team (they won 2nd place in the relay) and other celebrities. The following day (Saturday), we did a 50km ride to check on the bike and run course. It was good to see the route so that I can plan my strategy on the bike and run course. In the afternoon, we attended the race briefing, the video was awesome. 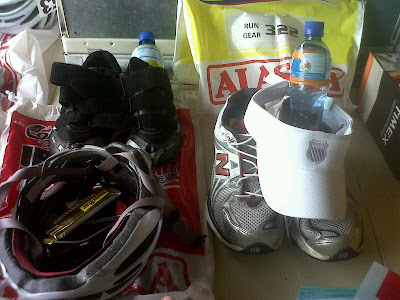 After the briefing we started to prepare our bike and run gears and get ready for the bike check-in. Bike gear check, run gear check. Im ready! At the bike check in. It was a wonderful day, woke up at 2:00am, had a good 5 hours sleep, as always you can’t sleep much the night before a big race. I had coffee, bread, and banana for my pre-race meal. My wife and I had a short prayer before heading to CWC. At the race site, went back to the bike check in area to put in my race belt and made my final check on my bike and gear. Then we proceeded to the race numbering station where I met senator Pia (she was right behind me). I was able to talk to her briefly and told her that it was my first time to join the race, she welcomed me and told me to just enjoy the race. My target time for the race was 6:30 to complete the 1.9km swim, 90km bike, and 21km run. Jay and I reviewed with Coach the split times for each event based on our own pace. It was good to set a target time rather than just focusing to finish. It gives you a personal challenge to enjoy the race (well, joining this event is a challenge already, what am I thinking??). Before the race, we had a short prayer (again!) and prayed for the safety of all participants and thanking the Lord for the blessings and for the opportunity to join this event. First time to do Ironman 70.3 for Diego, Jay, and myself. With us is Joan who participated in Langkawi Malaysia Ironman. Coach giving some last pointers. At the start line of the swim course, the age groupers were very anxious to hear the gun start. I positioned myself at the back, can’t risk battling it out with the more experienced swimmers. And off we go.. we started 2 minutes behind the Pros and Filipino elites. 5 minutes after the next age group followed, then the female age groupers, and lastly the relay swimmers. A lot of accidental kicking and shoving, but generally athletes played clean (at least from where I was). I tried to keep my composure as it was too stressful, I had to stop at the turnaround and waited a bit to find a safer spot. Checked on my time and saw that I was behind my split time. I then proceeded and just kept on swimming, saw pink swim caps, meaning female swimmers started to catch up on me. I didn’t mind but was conscious on the time as I might hit the cut-off time. Finally I reached the end of the first loop. My wife told me that Coach was jumping up and down as he was very happy to see me get out of the water. I think he was more tensed than I did. But it was a job well done for him because he was able to make a guy who can’t cross a 25m pool to finish a 2k swim. Thanks Coach! Spectators all excited watching the swim course. Energy is high in here. Whew! Another 450m and I’m through with the swim course. Can’t wait to ride my bike.. As soon as I was out of the water, I was relieved and told myself that I will enjoy every minute of the bike and run course (ahh, maybe only the bike course). I finished the swim course at 1:04:55. Bike waiting, only a few was left at the bike transition area. At the bike course, I was ecstatic. It was freedom for me to be on my bike. I just kept on pedaling and was smiling everytime I pass on other athletes. I saw Jay as I went out of the national road. Our forecast was that we will have a close finish at the run leg as he was strong in the swim and run. The spectators at the bike course were awesome, it was non-stop and everytime I passed by them I felt more stronger and was gaining speed. The kids from school were organized, they were chanting “Go Ironman!, Go Ironman!”. There were also some cheer prepared. It was a good experience. Aid station was good, we were just dropping our empty water bottles and take another one as we pass by. I dropped one during the handover at one aid station, but luckily after 200m there was the actual aid station. The volunteers had an advance group prior to the actual aid station. After an hour and a half, I saw Jay finally and he knew that I will pass. He was actually waiting for the “go bro!” from me. As soon as I get passed him, I did not waste time and continued overtaking more athletes. I knew that I had to get enough lead on the bike as Jay and I will definitely be catching up in the run leg. Yes, we had a mini race between Me, Jay, and Diego (expected to finish in 5:30). We were given plus one hour from Diego’s expected time. From the bike transition, feeling was weird as expected. I can’t even feel the pavement and my quads are cramping already. But I still managed to give a smile to my wife and gave her a kiss as I passed thru. The run course was hot!! I can’t even smile here anymore. The run course is a two loop course. Aid stations were strategically located and Gatorade and water were just overflowing. At the turn-around, the david’s salon team with David Charlton was there assigned at the aid station and was giving oranges, banana, and power gels aside from water and Gatorade. I began to feel cramps on my calves at the 4th km and from then on I was jogging and walking. I was able to get a second wind already and was ready to run, but my cramps were just killing me. I had to slow down. As expected, somewhere at the 4.5km I saw Jay already and knew that he will overtake me anytime soon as I can’t keep up with my run. He did pass me at 5th km and gone he was. Meanwhile, I was hoping to finish it not walking all throughout. I was trying to stretch once in a while so that I can run. I was just strolling and was taking it 1km at a time. On the second loop I was just enjoying it and was counting the remaining distance. I was happy as I know I will finish the race. And there it was, as I approach the finish line, I was smiling and have conquered another milestone. I finished in 7:10:12 (official time). At the finish line, with senator Pia extending her hand to congratulate me. With Fred Uytengsu and Senator Pia Cayetano at the finish line. Dante on the background, one of the guys who helped me to develop my swimming skills. With best friend Jay, another milestone for Gone Running Club. ..and of course a proud wife.. look at the background, its IronMark and IronKay! Kay was busy taking photo shots and was very supportive all throughout the event! Good job! Congratulations for persevering and finishing the race! Thanks Josiah! Im sure you will be doing the individual event next year. As long as you put your mind and heart to it, and practice you will make it. Just believe! Yup, hope to meet you in future races.